Riverfront camps and recreation areas such as the C&O Canal towpath are underwater. POINT OF ROCKS, Md. 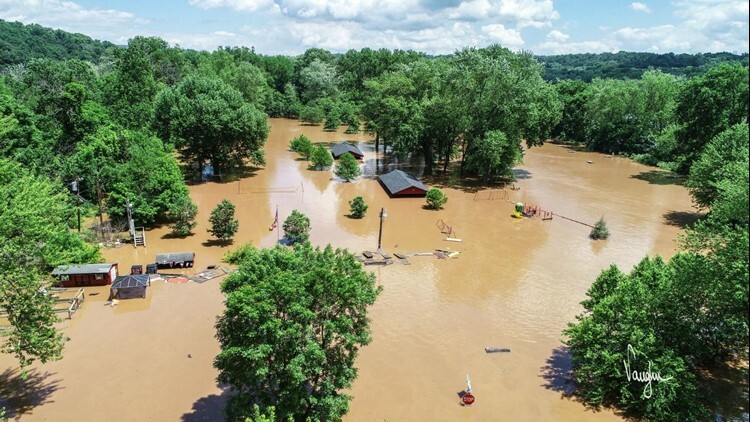 - A scenic section of the Potomac River between Harpers Ferry, West Virginia and Point of Rocks, Maryland is seeing some of the worst flooding since 2010. The Brunswick Family Campground near Brunswick, Maryland and facilities at White's Ferry, Maryland have been evacuated. The ferry is shut down and buildings at White's Ferry have been inundated with water. The river is expected to crest Monday at 26 feet on the Point of Rocks gauge, which is considered major flood stage by the National Weather Service. The Shenandoah River threatened historic sites in Harpers Ferry and flooded parts of Shenandoah Street, but did not rise high enough to damage any historic buildings. CSX and MARC train service have not been affected.